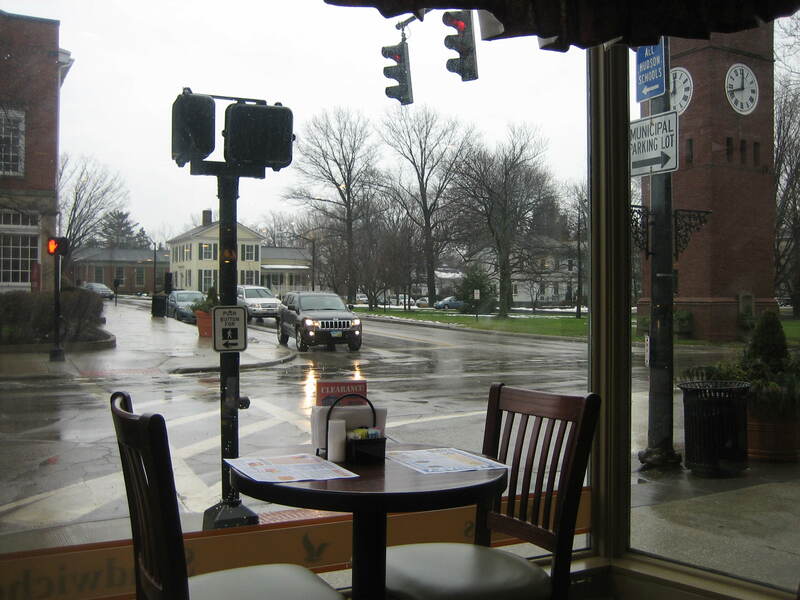 It’s a rainy day in Hudson, but for January I’m not complaining. Usually at this time of year we have a few feet of snow. Crazy weather these days! I decided to take my work out on a date. I love to work at coffee shops and I’m happy to say Hudson has quite a few. Hattie’s is located right in the center of town on Main Street. You can see our lovely clocktower out the window. It’s a Hudson landmark. The clocktower sits at the edge of the village green. Another time I’ll take you for a walk around the green, but on a dry day. In good weather I like to get a coffee and plop myself on a park bench there watching the world go by. We have a farmer’s market here in Summer and Autumn and there are also weekly concerts on the green in Summer as well as an old fashioned ice cream social every June. I love small town life, especially if the town is old and charming, and Hudson is that! Living here helps me imagine I’m still back in Boston for Hudson has that New England charm or maybe I should say New England has our Hudson charm. I told you how my life is filled with coincidences. Well, one of the places I lived in Boston was an area called Cleveland Circle (and in case you didn’t know, Hudson is near the city of Cleveland, Ohio) and the next town over from Hudson, a town I go through frequently, is called Boston Heights. That’s not all. I lived in another Boston town called Waltham and do you know some of Hudson’s clocktower parts were made in Waltham. There’s more! The little town of Waterloo, New York where my husband was raised had a clock factory, and you guessed it — more of the clocktower was made there. Did you ever feel you were exactly where you were supposed to be? Well, with all these coincidences I’m pretty sure I’m where I’m supposed to be. But let me tell you about the work I’m doing here at Hattie’s. I’ve written a book on the beautiful art of letter writing and I’m putting a few finishing touches on it. This book is a series of handwritten letters to the reader in which I share my experiences and enthusiasm for this lovely art form. Today people seem to think the art of letter writing is DEAD! Can you imagine anything so ridiculous? 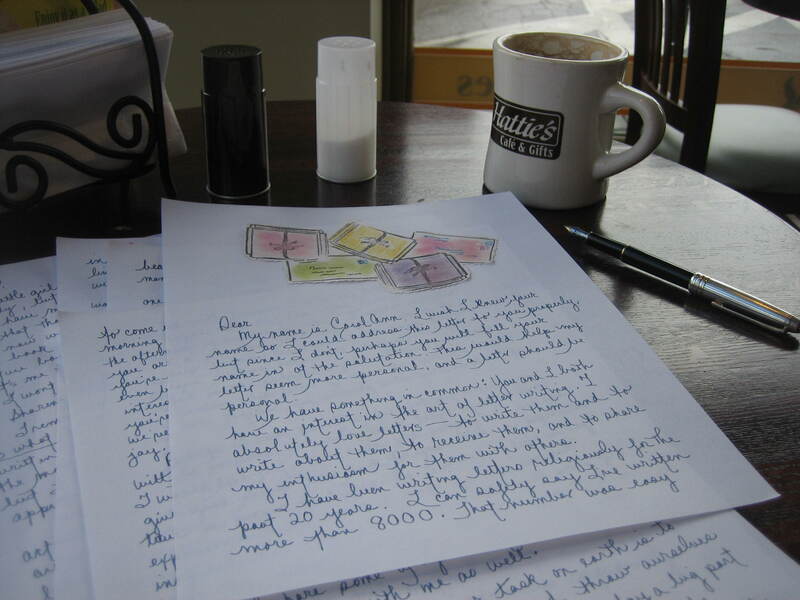 In the past 20 years I’ve written more than 8000 letters and I continue to write at least one more letter every day. Obviously I’m not writing to myself. All the letters I write are in answer to other letters sent to me by enthusiastic pen friends who share my passion for writing . So you see the art of letter writing is not dead. Modern people do exist who realize old and new forms of communication can and should co-exist. I hope you’re one of them. Unfortunately many people need to be awakened to the pleasure letter writing offers, the pleasure they’re missing, and that’s the purpose of my book. It is because I love to share joy that I’ve taken it upon myself to be an advocate for the beautiful art of letter writing. Hopefully my book will help with this mission. One of these days you might be able to buy my book right here on my website, that’s if I stop writing here and get back to work putting a few finishing touches on the manuscript. So back to work for me. Catch you next time and maybe at that time I’ll show you some of the art for my book of letters. Yes, get back to work, Carol Ann. We’re all dying to see the BOOK! From a lady who was lucky enough to receive one of your beautiful letters this week. Hi Amy. You are too kind. I’m working more on my talks these days then on my book. What are you working on? Havinf fun I hope.